Case Study. Middlebury replaces unsafe wired glass. 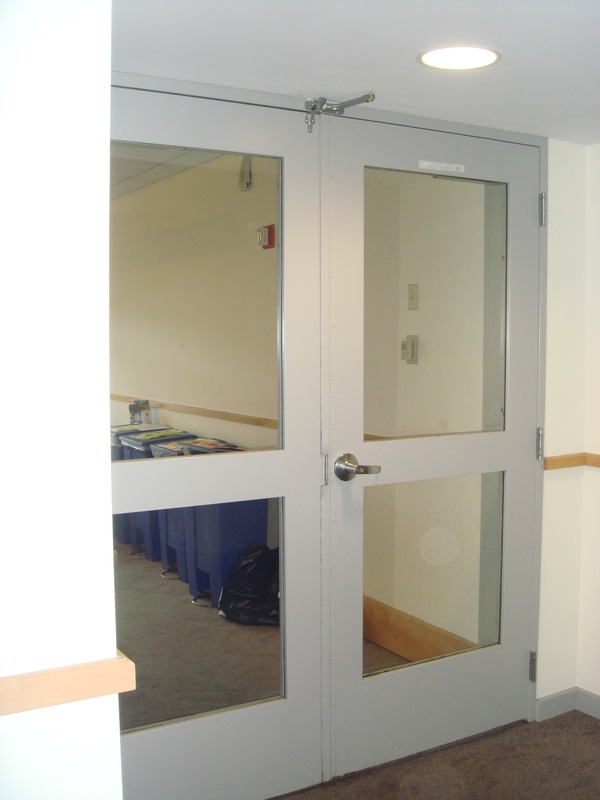 Realizing that wired glass is a liability because it breaks easily, Middlebury College officials elected to replace unsafe wired glass with clear, wire free, fire rated glass. Middlebury is not unique. U.S. schools built in the last century had little choice but to rely on traditional wired glass for fire protection. In the last decade, advances in fire-rated glazing technology led to safer, wire-free alternatives that provide both fire and impact safety. The International Building Code (IBC) serves as a model for local building codes nationwide. The IBC was changed in 2003 to require that all glazing in potentially hazardous locations in new educational facilities must comply with the Consumer Product Safety Commission’s (CPSC’s) safety-glass standards. This code change removed the exemption for unsafe wired glass. Unfortunately, local jurisdictions can be slow to adopt progressive changes. 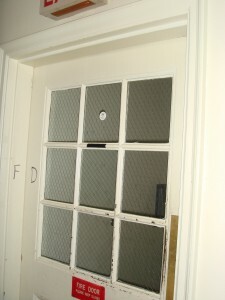 A photo of the unsafe wired glass that Middlebury has now replaced. 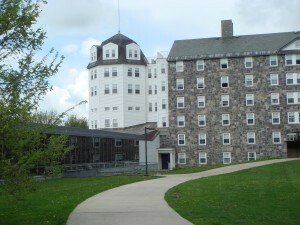 Kate first toured Middlebury during freshman orientation in Fall 2007. She wasted no time in alerting the college’s Directory of Facilities, Norm Cushman, of the potential hazard. She wrote, Although the IBC may not yet be adopted in Vermont, I would like to bring to your attention to the dangers of wired glass, and let you know that there have been thousands of injuries as a result of accidental impact with wired glass in safety glazing locations. Kate also mentioned the death of a University of North Carolina student the previous year when he crashed through a wired glass panel in his dorm, a wired glass injury at Williams College, and two wired glass injuries on the Middlebury campus. Kate did more than point out the problem; she offered a solution. She had worked previously with her son high school to evaluate and replace wired glass in hazardous locations. [Click here to see Part I of the San Francisco school case study, and click here to see Part II of Fire and Impact Case Study. The NCIS high school facilities manager Daniel Klingebiel, summed it up best: I sleep better at night knowing the wired glass danger has been removed. 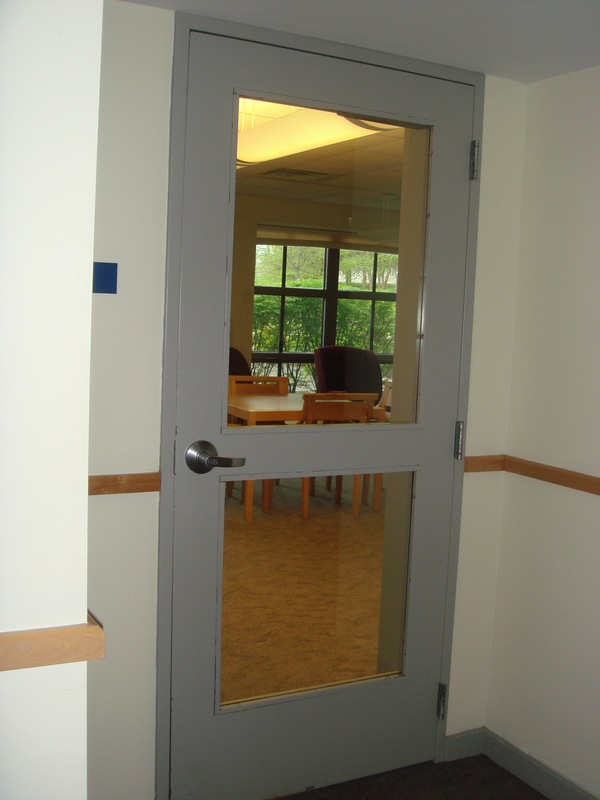 With Kate’s prompting, Middlebury facilities officials realized that by replacing unsafe wired glass with glazing that is both fire and impact safe, the college could eliminate an unnecessary liability and dramatically improve campus safety. Even though Norm and his staff had not been aware of either the hazards of traditional wired glass or changes in the building code, they acted quickly once they became aware of the problem. Within a month, Middlebury had surveyed and catalogued every piece of traditional wired glass panel on campus. They completed a spreadsheet noting the location and size of over 1500 pieces of traditional wired glass in doors and windows. Kate and Norm then reviewed the spreadsheet to determine which glazing panes were fire-rated, which were in hazardous locations and which presented the highest risk for human impact. Through this process, they were able to identify which glass panels most needed replacement. The college established a multi-year, endowment for the wired glass replacement program. Middlebury chose instead to replace unsafe wired glass over time with clear glazing that is both impact and fire safe. We will continue to make replacements over time, explained Middlebury Wayne Hall, our goal being to eventually replace all wired glass with the appropriate glass. SuperLite I was selected for 20-minute, fire-rated doors, due to its affordability and superior optical clarity when compared to unsafe wired glass. It meets the CPSC’s highest human impact standard (Cat II), and is the most economical fire and safety rated glazing available. SuperLite I-XL was selected for 45-minute sidelight applications. This patented specialty tempered glass not only meets the CPSC’s highest impact standard (Cat II), but also provides partial radiant heat protection when compared to glass ceramics or wired glass. The local building authority approved the use of SuperLite I-XL in locations normally requiring hose stream test compliance, even though the product doesn’t meet the test. It has become commonplace in the U.S. for building officials to exercise their judgment and recognize the value of alternate materials that may be in conflict with the code, yet offer a compelling performance and/or price advantage. Middlebury took advantage of both benefits. 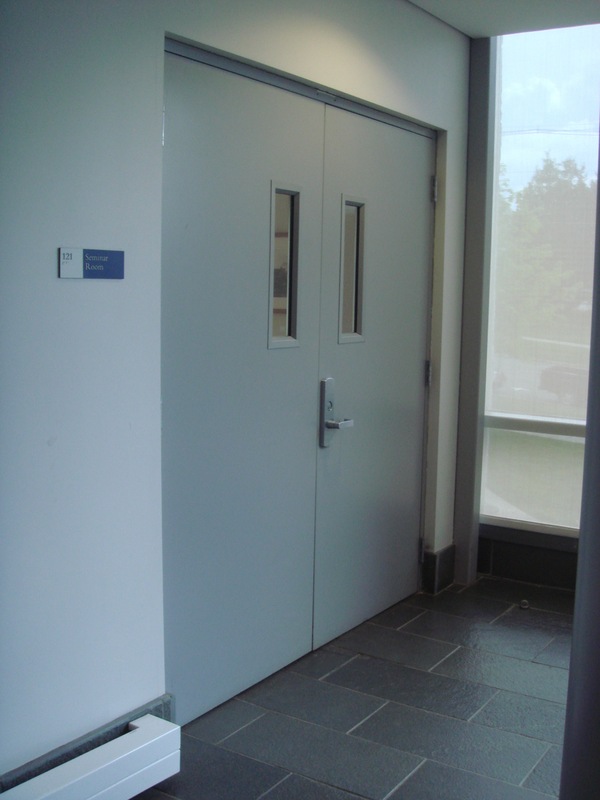 Pyran Platinum F by SAFTI FIRST was used as 100 square inch vision panels in 60- and 90-minute temperature-rise doors and in athletic facilities. Pyran Platinum F is a glass ceramic free of toxins and hazardous heavy metals with a neutral coloration similar to float glass. It also meets the CPSC’s highest impact standard (Cat II). Feeling relieved of at least one parental worry, Kate affirmed: I’m proud to be affiliated with the Middlebury wired glass replacement program. Once the school learned about the hazards of wired glass, they acted quickly to improve school safety in a fiscally responsible way. At graduation I noticed an added benefit: the clear fire and impact safe glass looked a lot better than the institutional looking, unsafe wired glass. Do you have a current or upcoming project that needs fire rated glass and framing? Contact us today!